The weather is changing and the nights are getting lighter, which can only mean one thing…summer. And with summer comes festivals, in particular food festivals, and we have gathered some of the best to consider. The Big Feastival is taking place on Alex James’ Farm in the Cotswolds from Friday 23 August to Monday 26. It will welcome some of the world’s top chefs. They will demonstrate their expertise in cooking skills live on The NEFF Big Kitchen stage. Raymond Blanc and Tom Brown are just two of the names who will headline, together with a host of music acts including the Zutons, Elbow and the Fun Lovin Criminals. Look out for the Collaboration Kitchen. Here special edition dishes will be served up with all proceeds going to Charity Partner, Action Against Hunger. Smoked & Uncut at THE PIG near Bath on 15 June features a line-up of handpicked classic and contemporary artists, including Imelda May and the Kaiser Chiefs, home-made festi-food, local ales and cocktails. Family style feasts will feature heavily with the focus on alfresco dining under canvas. While Mark’s ‘Ruby Murray House’ which will be dishing up indulgent home-style Indian curry. 24 and 25 August sees The River Cottage Festival taking place at River Cottage HQ, Axminster with food, music, talks, master-classes and a host of children’s activities. Vegan, vegetarian and gluten free food will be available and Hugh Fearnley-Whittingstall himself will be in attendance. Moving across the border, the Caernarfon Food Festival is on May 11 2019. 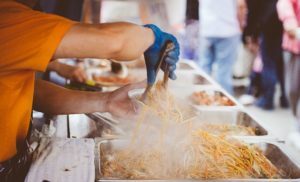 It promises to be “perfect for foodies to explore the food and drink producers from the local area.” The event will feature market stalls of food and drink, live cooking demonstrations and freshly cooked street food, celebrating local food and drink produce. There will also be live music from local bands, artists and choirs. Any Reason to Hold a Festival? Finally, there must be a mention of the Cooper’s Hill Cheese Rolling on May 27, 2019 when a 4kg cheese is thrown off a terrifyingly steep hill chased by people in Brockworth, Gloucester. In theory, the aim of cheese-rolling is to be the first person to catch the wheel of cheese; but nowadays, the majority of people participate in the event to raise money for local charities and other good causes. Lots of food festivals this summer in the South West of England and South Wales. So if you’re a catering business, think what food festival could you hold this summer to boost trade? Or where you might go as a mobile caterer?